Driving the winding roads of Edisto Island past massive oak trees and historic church yards, it seems the island has been frozen in time. Indeed, this 68 square miles of sea island serenity is very much a journey back to a more relaxed, slow-paced era. The grand old island was formed from ancient sea bed millions of years ago, which left deposits of soil rich with calcium deposits and a network of inland creeks and streams that would flourish with flora and fauna. Among the numerous early settlers which hunted its game and tilled its soil where the Edisto Indians for whom the island is named. Indian middens and artifacts show that the island was a plentiful hunting ground for centuries, until the first English settlers brought permanent agriculture. Although Edisto is not far from Charleston as the crow flies, it was a full day’s steamboat trip in antebellum times, and still a 45-minute drive from downtown Charleston today. The distance kept the island isolated for centuries, and the first bridge was not built for automobiles until after World War II. The flourishing natural surroundings were ideal for cotton growing, and dozens of grand plantation houses were built on Edisto during the early 1800’s, with more than 30 that still stand, including several in which walls are still marked by graffiti from Union soldiers who occcupied the island during the Civil War. 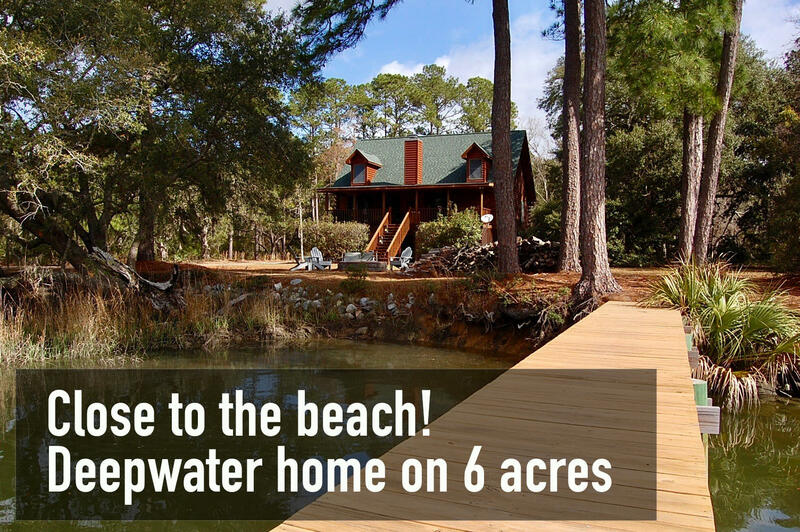 A new age of inhabitants has found the Edisto Island address to be as rewarding in a different way, as homes on the island offer a luxurious position amid so much natural beauty and outdoor enjoyment. Although technically a sea island, Edisto does have a long stretch of beach barrier, and ocean front homes with an unspoiled view of the pristine Atlantic coast. Sea-shelling, surf-fishing, bird and dolphin watching are as easy and natural on the three miles of beach as simply basking in the sun and escaping into a favorite book. Farther inland, the sparkling creeks wind through marsh and along forested areas, where outdoor pleasures include casting nets for shrimp, trolling for fluonder or bass, or quietly dipping into the welcoming water with a kayak paddle. Development has brought golfing, restaurants, and shopping opportunities to Edisto Island, and there are regular tours of historic plantation homes, as well as a world-class serpentarium with a remarkable live display of alligators, amphibians and snakes. everyday experience, with stunning vistas overlooking open expanses where egrets, herons, deer and wild turkeys are on display.